James Eland's sound is based on his movement of #GrabaBottle which insights his vision of party music. 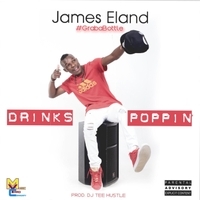 Drinks Poppin' as his first and latest commercial single he's determined to put Zimbabwe on shine as the rest of his fellow country musician are doing... Everyone's support helps an artist's growth and further recognition. In this business as I have learned "NO ONE IS LESS IMPORTANT THEREFORE EVRY SUPPORTIVE PERSON DESERVES RESPECT!" All purchases to this song will help in making James Eland produce and create more music. The money is helpful for the production of good music and growth of an artist as the business demands money and talent fused together to make the best product. For everyone that has been supportive from Family, Friends, Associates and Fans on my music and growth am very and still will be grateful for every support given henceforth. It's not an easy road but with your supportive hand over my shoulder, I know you can make me reach incredible and immeasurable heights. Shout out to fellow supportive musician and Djs from Zimbabwe itself to South Africa to the United States of America and all social media people.